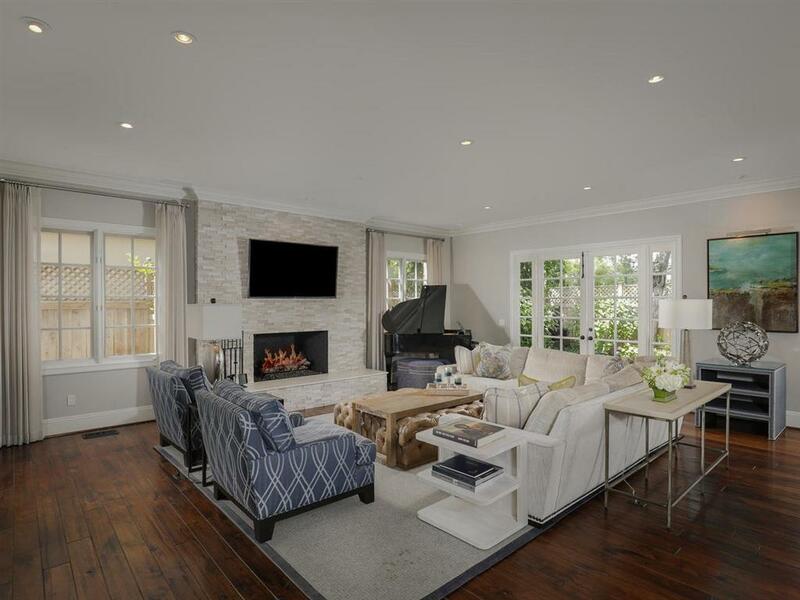 Seller Will Entertain Offers Between $2,925,000-$3,350,000! 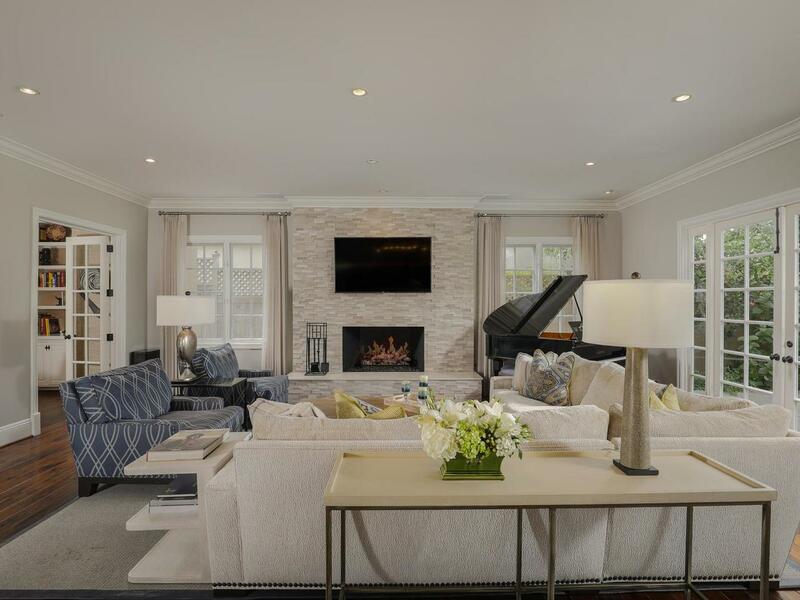 Experience the ultimate La Jolla lifestyle from this Country Club estate with a French exterior & soft contemporary interior! The stylish two-story entertaining home boasts a fabulous open concept floor plan with high ceilings & hardwood floors throughout, and a fabulous blend of indoor & outdoor living with French doors lining the walls of the living/dining room & kitchen that open up to the spectacular backyard with fireplace & market lighting! Step into the gracious two story foyer & prepare to be amazed by the clean contemporary pallet that has been updated with the modern family in mind. Soaring ceilings, crown moldings, distressed walnut floors, a bank of French doors opening out to the intimate lush garden & protected patio with centrally positioned stone fireplace so ideal for al fresco dining all welcomes you. Included on the first floor is: a cozy den/library with built-in bookcases just off the living room; an enviable open chefÃ¢â‚¬â„¢s kitchen with antiqued cabinetry & granite counters, a breakfast bar, eat-in breakfast nook with built-in bench & family room with computer desk, large walk in pantry & mud room opening to the attached 2 car garage; an elegant powder room; small basement wine closet & an en-suite BR with French doors that open to a side patio with tranquil, antique fountain. Climb the open staircase & find the restful master retreat with crisp white cathedral beamed ceiling, a sitting area with a raised marble fireplace surrounded by cabinets & shelving, a master bath/walk-in closet/dressing room that will knock your socks off & boasts premier fixtures! Also upstairs, youÃ¢â‚¬â„¢ll find 3 additional generous-sized bedrooms (1 of which features an en-suite bath), 1 shared BA, & a spectacular laundry room with storage & counter space for folding. The home was recently updated to include new paint inside & out, new carpeting upstairs, new patio & stone fireplace & new fencing in front & back of property, new chandeliers & wall sconces, redesigned master closet & dressing room & much more. Best of all, the home is easy access to the Village, freeways, shopping & schools, making it an ideal location for the busy family!